The Middle Stage – Are we there yet? | Sydney House. The Middle Stage – Are we there yet? I read once that every renovation has a difficult “middle stage” but until you’ve been through it, the concept seems less threatening. You reach half way and things get hard – for whatever reason. It couldn’t be too bad could it? More accurate for us is that this “hard part” actually came after the “middle stage”… but it definitely was the lead up to the “final stage”…which are now in for at least the next 3 months. The beginning of any new project, as my professional life has proven, is characterised by the exuberance and patience of a new parent: you’re excited, interested in every detail but don’t want to hurry things along lest you turn out to be naively optimistic about how quick things happen. Once you’re out of the ground there’s a triumphant feeling that pushes you well into the said “middle stage”. It’s the great momentum you need, and your budget still somewhat in-tact. By the time the middle of the project arrives, a lot has been achieved. You can pat yourself on the back. Smile at how well things are going, and happily assume all will continue as smoothly as it started. 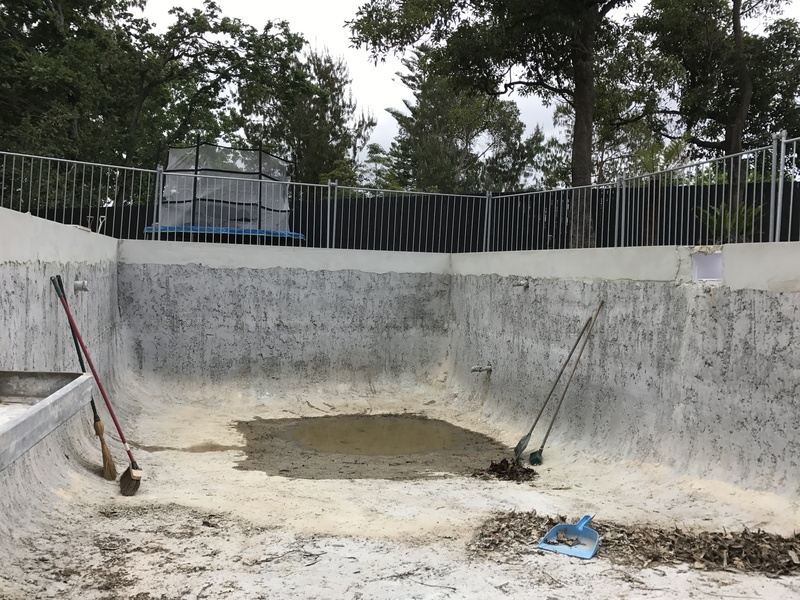 For us, the middle stage of the project marked the second storey of the living room being built, the footings for the deck were in, the windows were ordered, the pool had been dug. We felt good. And then it feels like everything starts to happen in slow motion. The change in mood, for me, was inexplicable. Perhaps it could be explained partly by the 4-6 weeks of torrid rain throughout July-August, a normally dry period in Sydney (so we thought). Work is, of course, being done daily – a lot of it. But it’s the work that sometimes can’t be seen or appreciated. 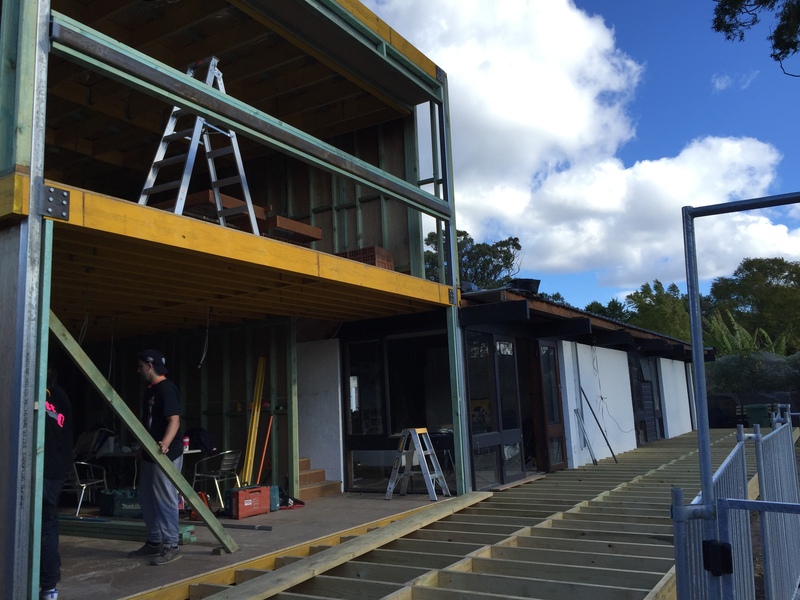 Things feel like they aren’t happening, and yet tonnes and tonnes of soil have been removed from our yard, multiple and regular rubbish batches have been taken away, lots of formwork has been built, cladding and roofing is in progress, a concrete slab for the garage has been poured and endless other tasks. But you start to think “when will it all end”? That feeling arrived for me in October. To be fair, we are living in our renovation, a thing most mortals would not do. But we did not have the cash to spend renting, and the existing house was entirely livable and unaffected by the extensions. Being on-site daily (from wake up!) had its benefits too: seeing the trades everyday, having a quick meeting, ordering materials and coordinating details is definitely easier. And then in a fit of exhaustion, one’s mind invariably wonders to thoughts like “hmm, so much rubble everywhere” or “I cannot walk down the driveway without getting mud through the house” and “the yard is a dustbowl, RIP green grass” or “when is the pool going to be filled?” or “can we get decking down so we can walk around properly?” and other earthly matters. Early mornings, late nights, noise and privacy issues invariably drive you slightly mad while trying to cope with 2 kids, laundry, cooking, finances..oh, and full-time work! So, as we got closer to “lock up” for the extension to the living room, we all got very excited. 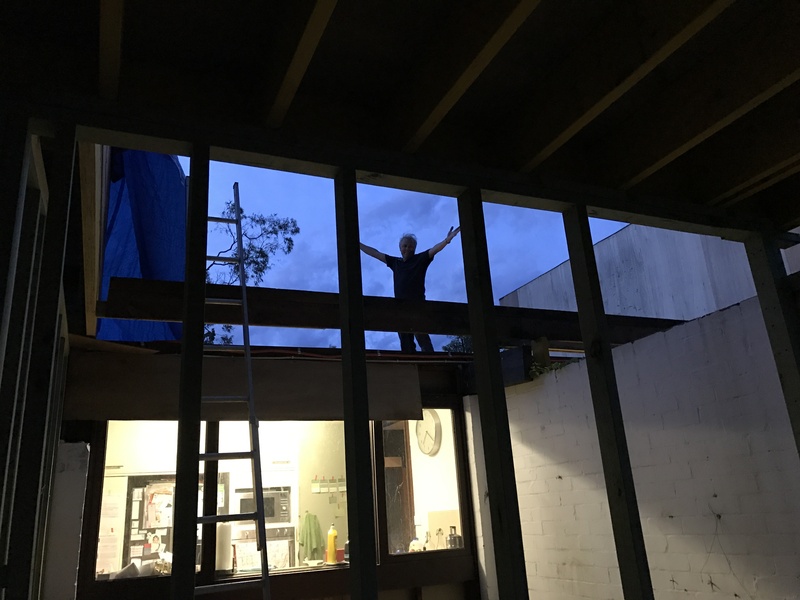 This meant it was time to remove the existing roof, replace it with modern Lysaght Kliplok in Colorbond Monument and totally seal any joins running to the new extension and joining to the old house. Hoorah! The boys checked the weather daily once the roofing sheets had arrived, and waited days for clear weather. Finally the week of October 9th was showing to be perfect and sunny throughout. The day itself proved to be dizzyingly hot, but the team was cracking through with the removal of the old, rusty roof and ancient insulation so as not to lose time. It was an all-day process to remove, clean and dispose of the old materials for a section of about 120 sqm. At the end of the day, it’s was just Gyprock giving us shelter and tarps were placed on the roof. After all, the forecast was sunny! All materials were prepped for the new roof to go on at 7am next morning. Checking the forecast once more before dinner on October 9th, it had suddenly changed to “30% chance of rain” on the iPhone. WHAT?! We freaked out big time! Got back up on the roof to check the tarps and then…realising we could not do much more, we reluctantly went to bed. We’d hoped it would be a sprinkle or that it would pass over and not rain at all. We were up late and no rain was in sight at 11pm. We slept. 1.30am. Pouring, torrential, windy rain! Not dripping, not sprinkles… but big fat droplet-style rain. Oh bugger we thought: “please end soon”. We went out to the lounge room. Between gaps in the beams and Gyprock, in corners and old vents where the tarps were not coping well…there was water starting to drip through due to the wind and angle of the rain. Every pot, pan, bucket and towel in the house was dragged out to catch the drips. By the time we did that, there were drips in our room, our son’s room, down our daughter’s walls and throughout the kitchen and main bathroom. It was lucky we were awake and trying to catch every drip we could and move furniture all over the house to avoid water…but oh NO! After about 3.30am the rain began to ease and then finally stopped around 4am. It was horrible. It felt soggy and smelled musty inside. Our son’s room was too wet to sleep in so he slept with us. Our daughter was huddled near the non-wet part of her bed. Our lounge was on its side to avoid water damage, towels and buckets everywhere. We tried to sleep. We didn’t need this event added to our “middle stage” at all! We would inspect the damage in morning to find that our beautiful P&S house now had chalky Gyprock walls, very wet carpet, lifting cork (not the original cork! Yes, afraid so) in the kitchen and crumbling ceilings, water stains down the beautiful beams…and that was only the stuff we could see. The week was spent cleaning up – a whole week washing towels, sheets, cleaning floors, buckets, running fans, wiping walls. By mid week we realised a coat of paint was not going to fix the water stains down the walls and across the crackling ceilings. We would have to use our Construction Insurance to repair or replace many or most of the ceilings and walls. They were so wet and weak for the entire week, that one wrong step on the roof by our builders and a hole would appear through the ceiling. Ugh. Fortunately, our builders pressed-on and were able to put the new roof and insulation as planned on Tuesday…somewhat nervous about the prospect of any more random storms they worked very fast indeed. Evening of October 9th, putting on roof tarps and praying for no rain! For the sake of my peace of mind, I’m glad you delayed your post on this until after Christmas, and also followed really quickly with a real success story on what you have achieved since. The house and its story are both now looking absolutely uplifting, its a real triumph for your family, thanks for posting again. Thank you so much Geoff! I hope you enjoy the reading. There are a few new posts up and I hope I’ve been able to bring the story so far up-to-date. You’ll enjoy the Progress Photos post.